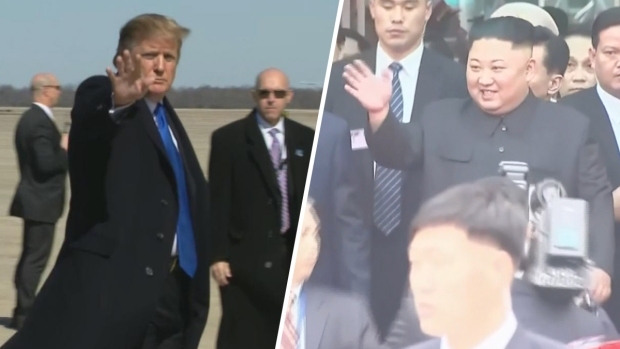 After long journeys to Vietnam, U.S. President Donald Trump and North Korean leader Kim Jong Un are in place for their second summit to address perhaps the world's biggest security challenge: Kim's pursuit of a nuclear program that stands on the verge of realistically threatening targets around the planet. Although many experts are skeptical Kim will give up the nuclear weapons he likely sees as his best guarantee of continued rule, there was a palpable, carnival-like excitement among many in Hanoi as the final preparations were made for the meeting. There were also huge traffic jams in the already congested streets. The two leaders are to meet over two days, first at dinner on Wednesday followed by meetings on Thursday. 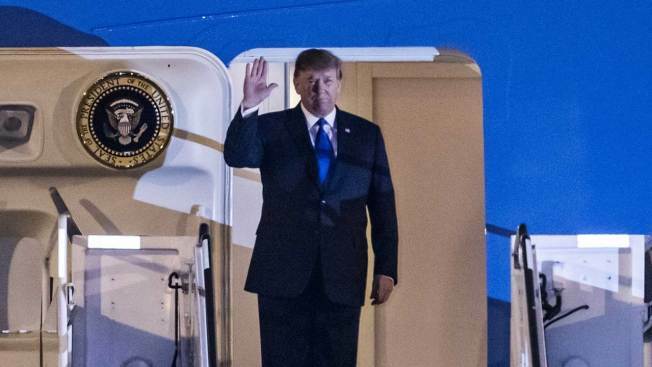 Trump arrived late Tuesday in Air Force One after a flight that included refueling stops in England and Qatar. He shook hands with dignitaries on a red carpet that was flanked by members of the Vietnamese armed forces dressed in crisp white uniforms. The route to his hotel was decorated with American, North Korean and Vietnamese flags, and adults and children peered out upper floor windows holding up cellphones to capture Trump's arrival. "Tremendous crowds, and so much love!" the U.S. president tweeted. Kim's journey to the summit, though shorter, was even more protracted. To get to Hanoi, he took a nearly 70-hour train ride through southern China and then traveled from a Vietnamese border town in his limousine. 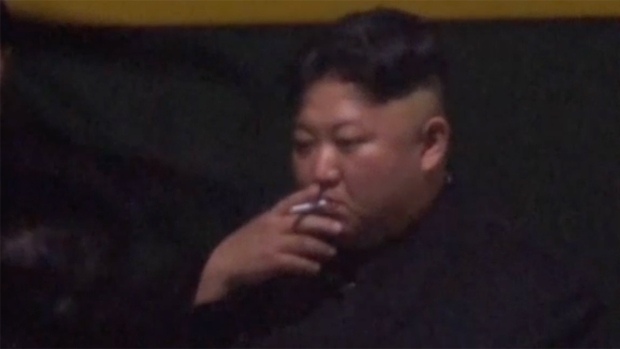 Hours ahead of his border crossing at Dong Dang, footage from Japanese TV network TBS showed Kim taking a pre-dawn smoke break at a train station in China, a woman who appeared to be his sister, Kim Yo Jong, holding a crystal ashtray at the ready. In Hanoi, soldiers, police and international journalists thronged the streets outside his hotel and hundreds of eager citizens stood behind barricades hoping to see the North Korean leader. As flags from the three countries fluttered in a chilly drizzle, dozens of cameras flashed and some citizens screamed and used their mobile phones to capture Kim's rock-star-like arrival. "I like him," local resident Van Dang Luu, who works at a nearby bank, said of Kim. "He is very young and he is very interesting. And he is very powerful," she said. "Trump is not young, but I think he is very powerful." Kim ventured out of his locked-down hotel — traveling news media who were told to use it as a staging area were kicked out — and spent Tuesday traveling around the Vietnamese capital in his armored limousine. With a squad of bodyguards in tow, he visited sections of Hanoi, including his nation's embassy where a loud cheer went up as he entered the compound. 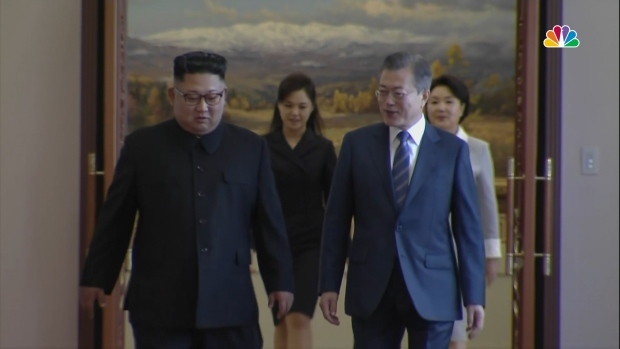 The leaders first met last June in Singapore, a summit that was long on historic pageantry but short on any enforceable agreements for North Korea to give up its nuclear arsenal. North Korea has spent decades, at great economic sacrifice, building its nuclear program, and there is widespread skepticism among experts that it will give away that program cheaply. Trump laid out ultimate goals for both the U.S. and Kim in an appearance before the nation's governors Monday before leaving Washington: "We want denuclearization, and I think he'll have a country that will set a lot of records for speed in terms of an economy." Trump has praised Pyongyang for ceasing missile tests, and he has appeared to ease up on demanding a timeline for disarmament. Kim is seeking relief from crushing U.S. sanctions. Even as he tamped down expectations that he'll achieve big strides toward denuclearization, Trump was still eager to claim an attention-grabbing victory to offset the political turmoil he faces at home. That eagerness for a victory, however, has spawned worries across world capitals about what Trump might be willing to give up in the name of a win. There seems less mystery about his North Korean counterpart. Survival of the Kim regime is always the primary concern. Trump was the driving force behind this week's summit, aiming to re-create the global spectacle of his first meeting with Kim last year. Four main goals emerged from the first Trump-Kim summit: establishing new relations between the nations, building a new peace on the entire Korean Peninsula, completing denuclearization of the peninsula and recovering U.S. POW/MIA remains from the Korean War. While some remains have been returned to the United States, little has been achieved on the other points. Korean and American negotiators have not settled on either the parameters of denuclearization or a timetable for the removal of both Korean weapons and American sanctions. "I'm not in a rush. I don't want to rush anybody, I just don't want testing. As long as there's no testing, we're happy," Trump told the governors on Sunday. As host, Vietnam is eager to show off its huge economic and development improvements since the destruction of the Vietnam War, but the country also tolerates no dissent and is able to provide the kind of firm hand not allowed by more democratic potential hosts. AP journalists Yves Dam Van, Deb Riechmann, Hyung-jin Kim, Adam Schreck Hau Dinh and Kim Tong-hyung contributed to this report.